Where can a Bubble Party be performed? We come to YOU! Over the past ten years, we have performed hundreds of Bubble Parties at day care centers, child care facilities and residences throughout the South Shore. In most cases, Bubble Parties are performed outdoors, where children can be in an open space and enjoy the music and bubbles and have plenty of room to run around. We are able to perform indoors provided that the space where the party will take place is an open, fully carpeted space. Call us at 781-848-4235 for more information on our specific requirements for indoor performances. What happens if I book an outdoor performance and the weather is inclement on the day of our scheduled event ? Do you schedule and hold "rain dates"? All decisions concerning inclement weather are made on the day and date of your scheduled performance. In the event of inclement weather, we would first explore the possibility of performing indoors, should you have a space that fits our requirements for indoor performances. Should an indoor performance not be an option, we will re-schedule our services for your event to a mutually agreeable day, date and time. Due to the popularity of this program, and because we do book on a "first come, first served" basis, we are unable to schedule "rain dates" in advance. How much does it cost for a Bubble Party Performance? All Bubble Party rates are based on a one hour performance. Weekday rates start at $200 and Weekend rates are as low as $275. Do you provide entertainment services for other age groups? Absolutely! 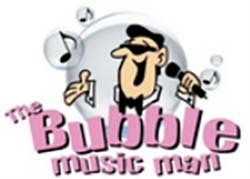 The Bubble Music Man and Bubble Parties are a service of Rob Peters Entertainment, where we "Create the Best Events In New England, One Celebration At A Time." Rob Peters Entertainment offers a variety of disc jockey entertainment services for audiences of all ages. Click here to visit their website, or call 781-848-4235 with the details of your upcoming event.